This two-party integrative e-mail negotiation is between a soccer star and her long-term representative over the terms of a potential new agency contract. This simulation is a good vehicle for discussing the dynamics of negotiating via e-mail versus face-to-face or through other media. It highlights issues regarding the principal-agent relationship, contract drafting, integrative and distributive bargaining, and the challenges in balancing substance, process, and relationship concerns. Download a FREE Teacher’s Package today! Wise advise. 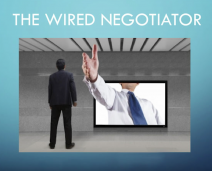 The use of technology like AI should blend with the Negotiation Trainers, to keep updated in the fast moving modern world. Thank you for this post. Adrian Villanueva (Singapore Consultant).